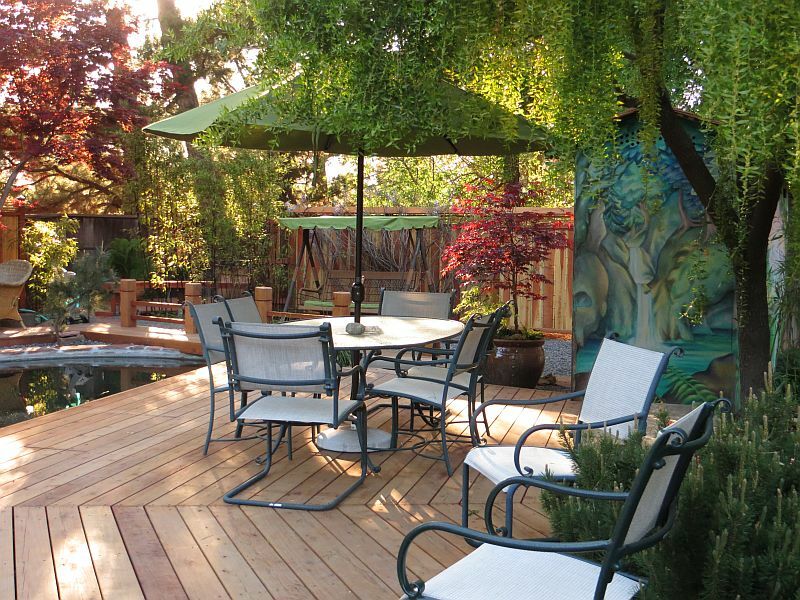 This serenely comfortable home and tranquil setting will melt your cares away. Soak in the hot tub, enjoy the gardens, swim in the pool, read a book by the fireplace. 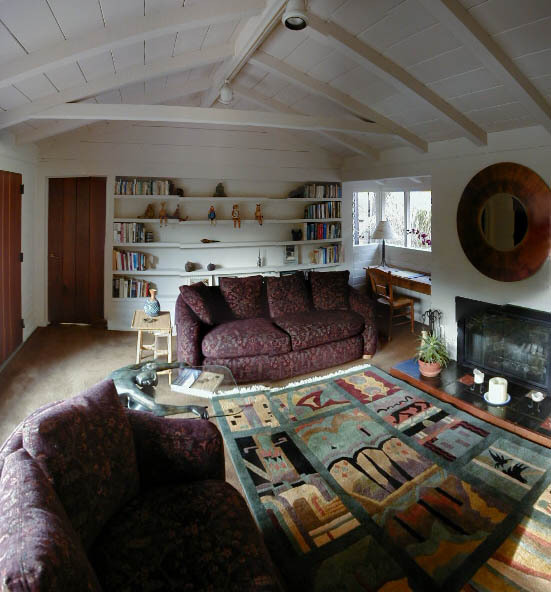 This is a classic Monterey Post/Adobe style house that has been fully remodeled and exquisitely furnished. 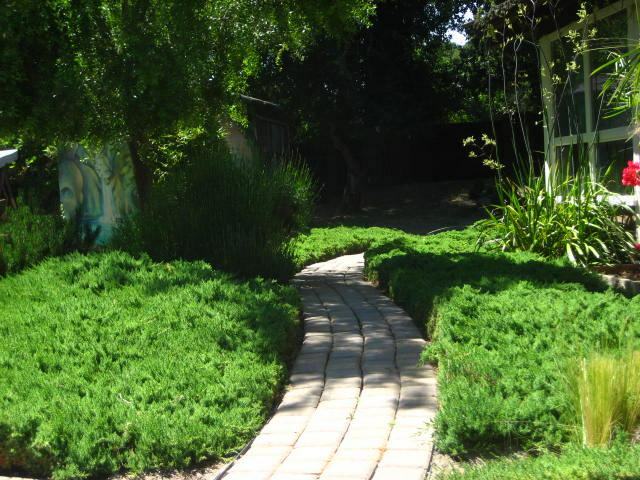 There are many inviting outdoor nooks to discover here. 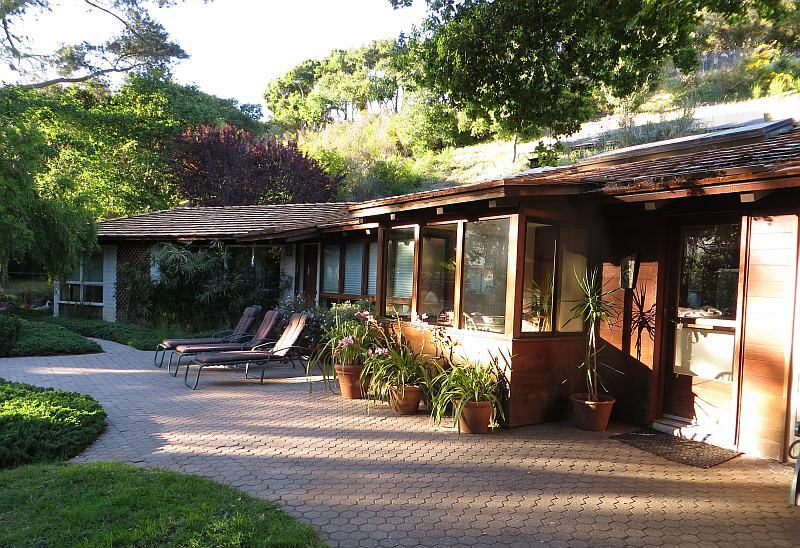 Walk to Carmel Valley Village and taste wine at one of the many tasting rooms or dine at a choice of international restaurants. Perfect for couples, families, personal, group, and executive retreats, or small quiet seminars and workshops. In this park-like setting, you can hear birds singing and frogs calling amidst the gentle rustling of wind through the pines. 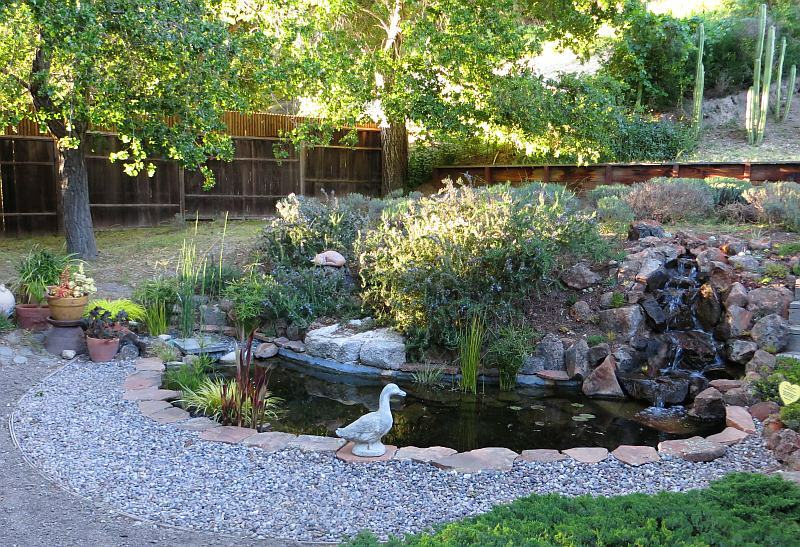 You may see an occasional hawk circling over the property or a blue heron skimming the pool. You'll be lulled by the light show of pool reflections throughout the day and the soothing sound of the waterfall at the fish pond. 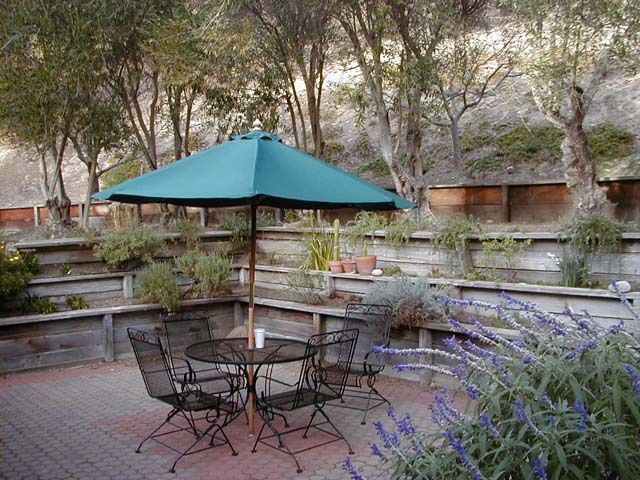 You'll enjoy eating, talking, and relaxing at the umbrella covered table in the patio surrounded by raised terraced gardens just beyond the dining room glass doors. In all of the bedrooms you'll find good reading light, clocks, and colorful bedding. The master bedroom has it's own CD and cassette player as well. Cozy living room with fireplace, Tibetan Rug, Oriental cabinet, book collection, view of pool and garden, writing desk, TV, VCR, Cable, CD, Tape, and Radio. 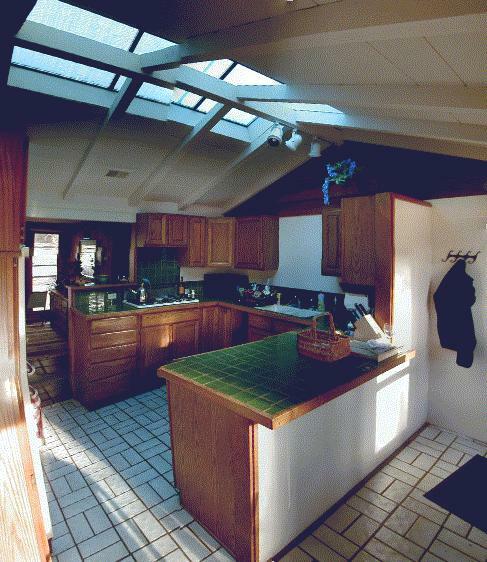 Fully equipped and very roomy kitchen. Gas cooktop, single gas oven, water filter, microwave, full set of utensils and cooking accessories, coffee maker, toaster oven, phone, breakfast nook (not in picture) with pool view, skylight. A redwood deck snugs up to a natural, pond-like full size swimming pool with solar heat. Pool is swimmable from approx. May through most of October. 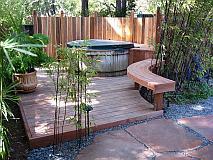 Hot tub behind bamboo provides serene privacy. 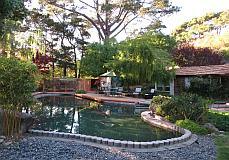 Pool and tub area surrounded by Pine, Maple, Willow, and fruit trees full of birds. Visitors include occasional deer, hawk, heron, duck, and other wildlife. The back terrace, accessible through glass doors from the dining room area, is surrounded by olive trees, flowers, and herbs. Up the back hill are fruit trees and two view decks. 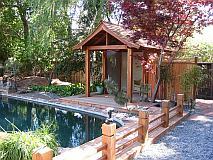 At the far end of the swimming pool, a lovely tea house provides shade and meditation space. 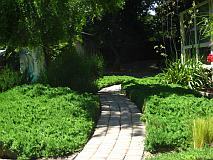 In front of the bedrooms curves an inviting path to the fish pond and waterfall.